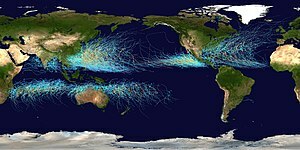 A major breakthrough in forecasting the number of Atlantic tropical storms has been achieved, say Met Office scientists. New research, published on Nature Geoscience web site today, reveals that the Decadal Climate Prediction System (DePreSys), developed at the Met Office, extends successful storm activity forecasts beyond the current season, providing predictions years ahead. Willis Research Network says the research has serious implications for the way insurers asses risk, allocate capital and strategically manage their portfolios going forward. This entry was posted in Met Office News and tagged climate science, hurricane, Met Office, tropical cyclone, tropical storm, weather, weather forecasting, willis research network. Bookmark the permalink.